Got your aquaponics media bed all filled up with rock and the system running? Now it’s time to add some Live Red Wiggler Compost Worms. These little things will help keep your grow bed clean and free of anaerobic zones. No one likes cleaning so having these in your system will allow you to go longer without cleaning your grow beds. They’ll turn everything they eat into a fertilizer for your plants and your fish will love to eat them as a treat. These worms are shipped from Uncle Jim’s Worm Farm and the facility is a USDA Federally inspected Facility. You can order these in 1 pound increments. 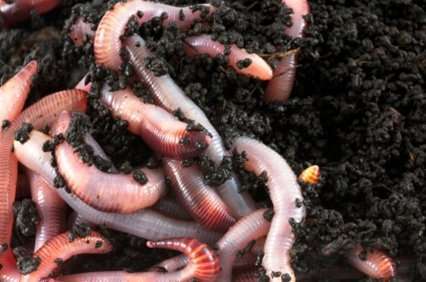 1 pound is roughly 1000 worms. This product is only available for people living in the United States. Orders are shipped every Monday and live delivery is guaranteed. Watch Sylvia Bernstein from The Aquaponic Source add worms to her media filled aquaponic garden. This entry was posted on Wednesday, January 9th, 2013 at 12:13 PM	and is filed under Hydroponics / Aquaponics. Both comments and pings are currently closed.